Medical Doctor, Glenn SIngleman began exploring the transformative power of an active adventure lifestyle in the 80's. As a professional expeditioner and documentary film-maker he's been part of many ground breaking, record setting projects. The first BASEClimb expedition to climb and BASEjump The Great Trango Tower in the Karakorum Himalaya of Pakistan in 1992 and the resulting documentary film inspired tens of thousands to take up adventure, including Glenn's wife Heather. Together Glenn and Heather have built an adventure tradition, pursuing new goals and bold challenges against the backdrop of awe inspiring wilderness. "Ultimately it's adventure that advances our understanding of fear, the performance process, ourselves and each other. It's our passion, and something we love to share with other people" says Glenn. Glenn Singleman and Heather Swan are a husband and wife team who are passionate advocates of a 100% plant-powered, active adventure lifestyle. They are World Record Holding extreme sport athletes and sought after inspirational keynote speakers and trainers. Glenn and Heather are recipients of many awards, including 'The Spirit of Adventure' Medal from Australian Geographic. Glenn is also a practicing medical doctor with a special interest in peak performance. He's the medical director for many ultra sporting events and specialises in emergency and remote medicine, He's also a multi-award-winning documentary film producer. Heather is a passionate wingsuit pilot, trail-runner, and a writer and photographer. "Glenn & Heather thank you so much for such an incredible experience! Lives have been changed from the gifts you have given. You stole the show! The feedback has been outstanding! I am so impressed not only with your stage presence but also your ability to relate and connect. The icing was the content and expertise your shared. Thank you." Kerwin Rae, K2 Elite Masterclass. 'Mission Possible' conference. Glenn and Heather's inspirational keynote has wowed audiences all over the world. Find out why they are the perfect choice for any event themed around Achievement, Peak Performance and Team Work. Glenn and Heather have worked successfully with many major and smaller brands to deliver the right kind of impact. For example, the Grand Canyon wingsuit project returned Sony over $500,000 worth of positive media exposure. Glenn and Heather's work ethic and their commitment to innovation, exploring 'what's possible?' and the ongoing pursuit of world class performance makes them a proven professional choice to represent discerning brand's wanting to stand out in a crowded market. Learn more about how Glenn and Heather can help your Brand fly! 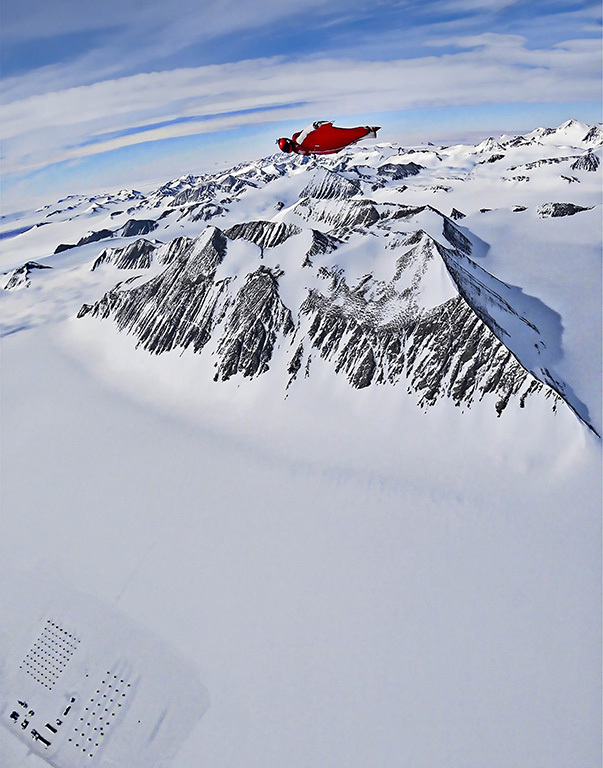 Currently we've got a few projects in the development phase - wingsuit flights in New Zealand, Nepal and Pakistan. Typically the permissions and permits for our projects can take years to organise and some like the one in Nepal are prohibitively expensive, but we believe in chipping away at our dreams, and sometimes, like in December last year magic happens. 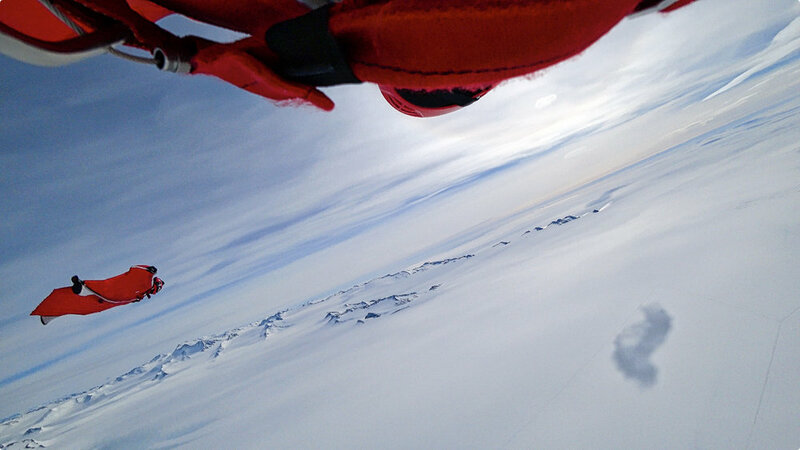 In an early Christmas present, we made the first wingsuit skydives in Antarctica. A completely surreal experience that will feature on Australian 60 Minutes soon. 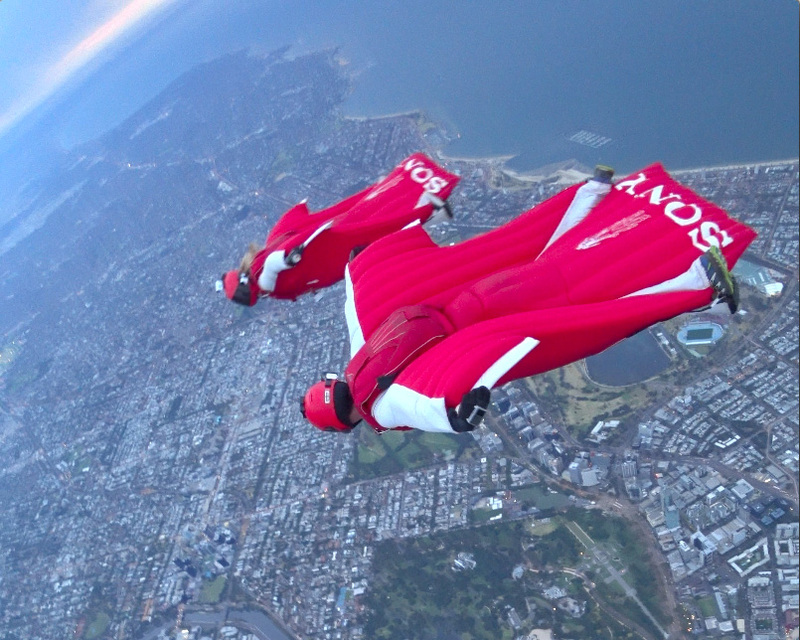 On January 21st this year we fulfilled another long held dream - to fly our wingsuits over Melbourne city. Last year we had to cancel this flight due to bad weather, so it was great to finally get it done this year. In June we're heading to Birdsville for the Big Red Run, Australia's only multi-day ultra running event. Read our latest blog post or subscribe to our newsletter to be the first to hear our latest news. Get inspired by our adventure photography, or watch some of our videos here. Sign up with your email address to receive training tips, whole food recipes and know-how, our adventure news and other updates.